MIAMI (December 22, 2017) – Last night, MSC Seaside, the ship that follows the sun, was named in a glittering ceremony by international screen legend and Godmother for all MSC Cruises’ ships, Sophia Loren. MSC Seaside, already recognized as one of the more innovative cruise ships in the industry, is the second ship to be launched in the past six months by the leading European cruise line as part of its industry-unprecedented 12 new mega-ships that MSC Cruises, the Switzerland-founded and based world’s largest privately owned cruise line, will bring into service between 2017 and 2026. Multiple GRAMMY and LATIN GRAMMY winner Ricky Martin headlined the events. The innovative MSC Seaside began her journey in Trieste, Italy, before arriving in Miami. 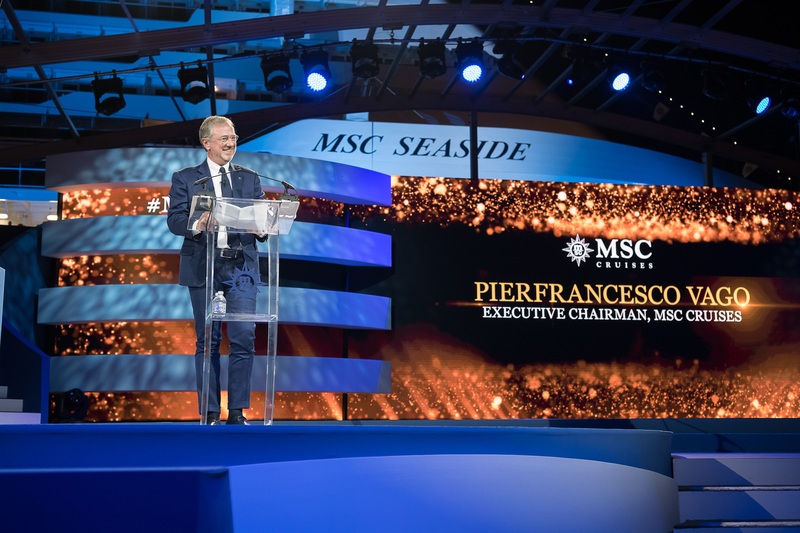 Pierfrancesco Vago, Executive Chairman, Introduces New MSC Seaside to Miami. 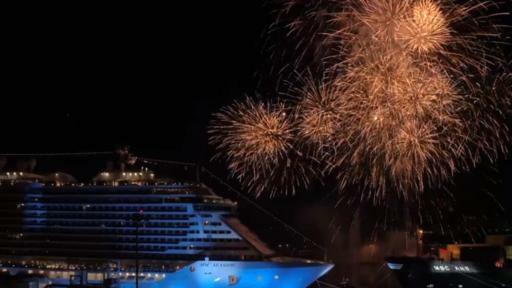 Fireworks erupt over Miami as the MSC Seaside is officially named. “MSC Seaside has been designed to spearhead the next phase of our growth in North America, a cornerstone of our global strategy. 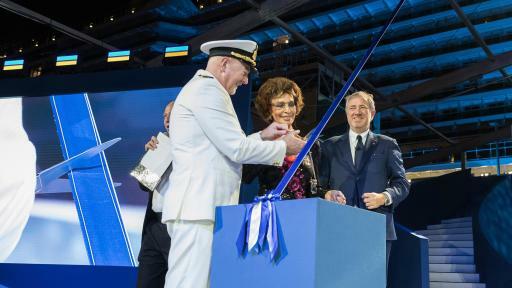 She will be one of three MSC Cruises ships to homeport in Miami – MSC Seaside, MSC Meraviglia and MSC Divina, one from each of our newest classes of ship. She marks our ambition to establish a significant presence in North America, after firmly rooting our position as number one cruise brand in Europe and having established a leading presence in other key cruise markets globally,” added Mr. Vago. 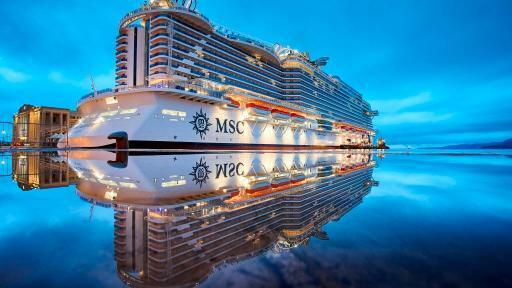 MSC Cruises also announced a new partnership specifically for MSC Seaside and relevant for the North American market. 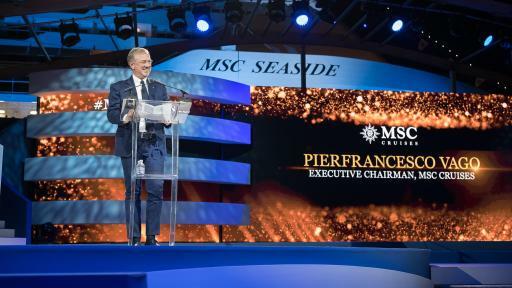 The new partnership with the Andrea Bocelli Foundation (ABF) where MSC Cruises’ guest donations will support ABF’s valuable work in Haiti, one of the poorest countries in the world currently facing exceptional challenges. Every dollar donated on board by a guest will go directly to the Foundation to make a real difference, establishing schools that become community centers and launching projects such as the Mobile Clinic, providing health care assistance and prevention, clean water, lighting and agricultural development, transforming the lives of their communities. In collaboration with the Andrea Bocelli Foundation, the project aims to reach over 2,550 children in five communities in Haiti. 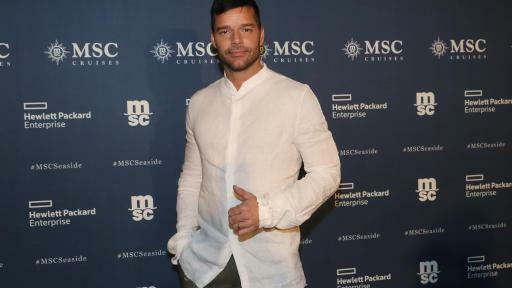 Headlining the entertainment for the evening’s Naming Ceremony was multiple GRAMMY and LATIN GRAMMY winner, Ricky Martin, who is well-known for his high-energy and thrilling performances that have captivated millions of people throughout the world. 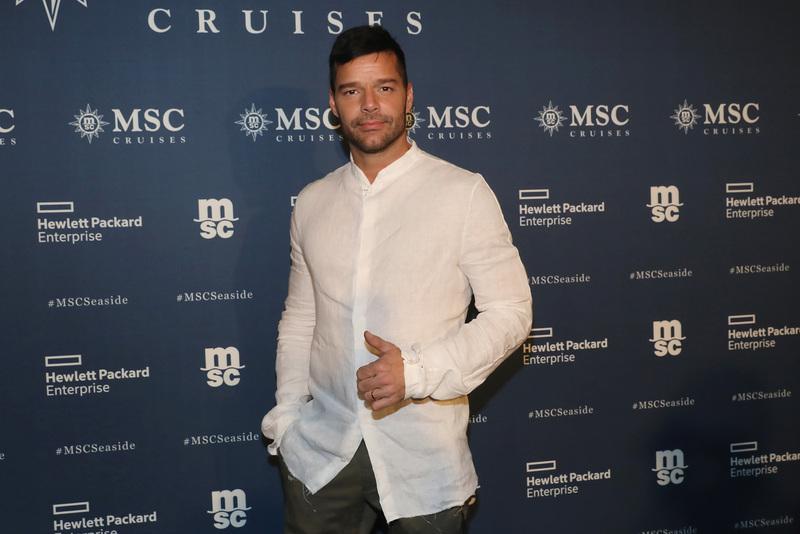 Beloved by fans worldwide for his instinctive understanding of rhythm, passion for performing, and equal compassion for giving, Ricky Martin truly encompasses the international spirit of MSC Cruises and the city of Miami. Making a guest appearance at the event was Miami football legend and Hall of Fame quarterback, Dan Marino, who was with the Miami Dolphins for 17 years. Earlier this year, MSC Cruises signed a partnership with the Miami Dolphins and became the official cruise line for the team, further strengthening the cruise line’s relationship with the South Florida community – where its US operations are based. Fans and guests will have the chance to experience the Miami Dolphins at sea and meet team alumni on a themed cruise on MSC Seaside in 2018. Marino presented MSC Cruises USA President Roberto Fusaro with a signed football helmet to be displayed on board as a symbol of the partnership. 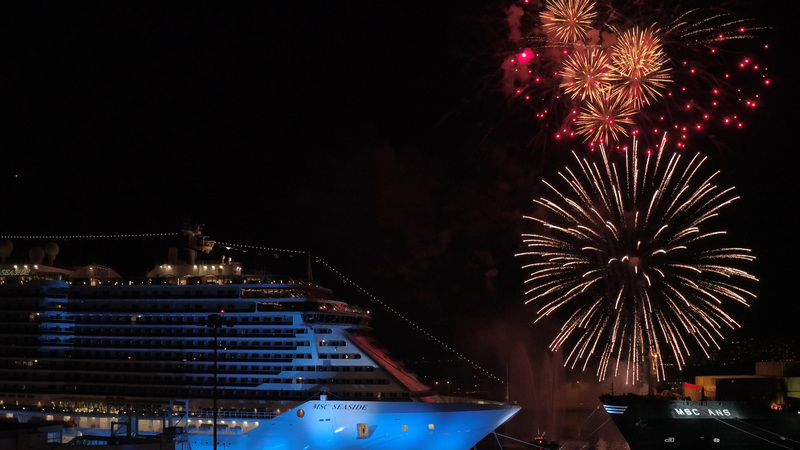 The finale of the evening’s events was the time-honored tradition of breaking a bottle of champagne over the bow of the ship as MSC Seaside was officially named aloud. 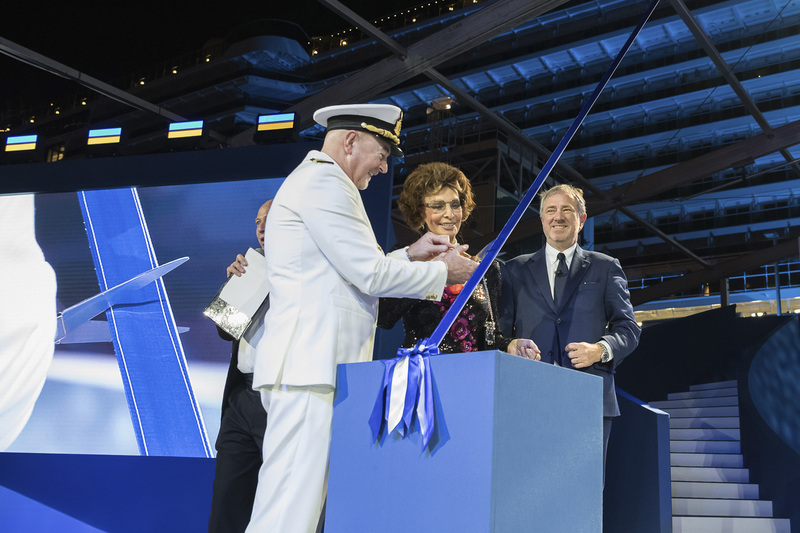 As a company with a strong maritime heritage dating over 300 years, observing these seafaring traditions is important to MSC Cruises and bringing good luck to this new ship tonight, as always, was Sophia Loren as Godmother to her 12th MSC Cruises ship. As one of the most celebrated Italian actresses of our time, the glamorous screen-legend is practically part of the MSC Cruises family. In charge of the whole evening’s entertainment was actor and popular American TV host, Mario Lopez, who served as the Master of Ceremonies. Lopez also welcomed guests to the star-lit festivities on the “Blue Carpet,” where celebrities gave interviews, took photographs, and met the crowds. Lopez then took to the stage to host the evening’s entertainment. But the main star of the show was none other than MSC Seaside.Quite unlike anything else at sea, MSC Seaside will shine among Miami’s skyline commanding attention with its revolutionary design. Inspired by the architecture and lifestyle of Miami, the ship will be right at home in warm South Florida waters. Highly-innovative in design as well as on board features, the ship will feature world-class entertainment, a range of international dining concepts, a gorgeous spa, outstanding family-friendly facilities, the private “ship within a ship” MSC Yacht Club, and expansive outdoor spaces. 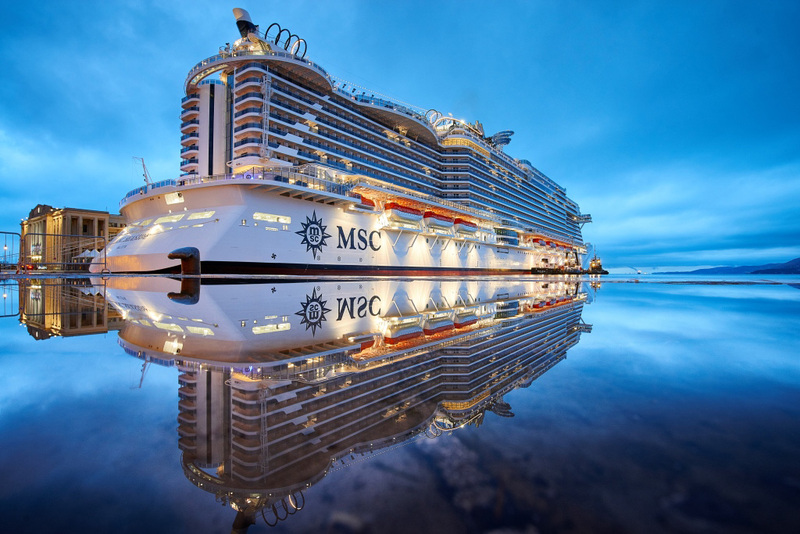 The striking MSC Seaside is just one more reason for guests from North America, and all over the world, to join MSC Cruises on an unforgettable trip that follows the sun. The MSC Cruises fleet currently comprises 14 ultra-modern, highly innovative and elegantly designed ships, offering an unparalleled vacation experience with always delicious and authentic food, award-winning entertainment, plenty of relaxation, comfortable accommodation, as well as impeccable service and expertise. The Andrea Bocelli Foundation (ABF) was established by Maestro Andrea Bocelli and his family with the mission to “empower people and communities.” In line with this, ABF is committed to help people which face challenges as a result of illness, poverty conditions or social exclusion, promoting and supporting national and international projects as well as encouraging full self-expression and breaking barriers. The Foundation is headquartered in Florence, Italy, but works in different countries through two main programs: Break the Barriers, which promotes projects to assist people in developing countries, and in any case people in situations of poverty, illness, and complex social problems that invalidate or reduce the quality of life; and Challenges, which aims to bring together the best minds to find innovative solutions to help people cope with and overcome the limits imposed by their disability/discomfort.